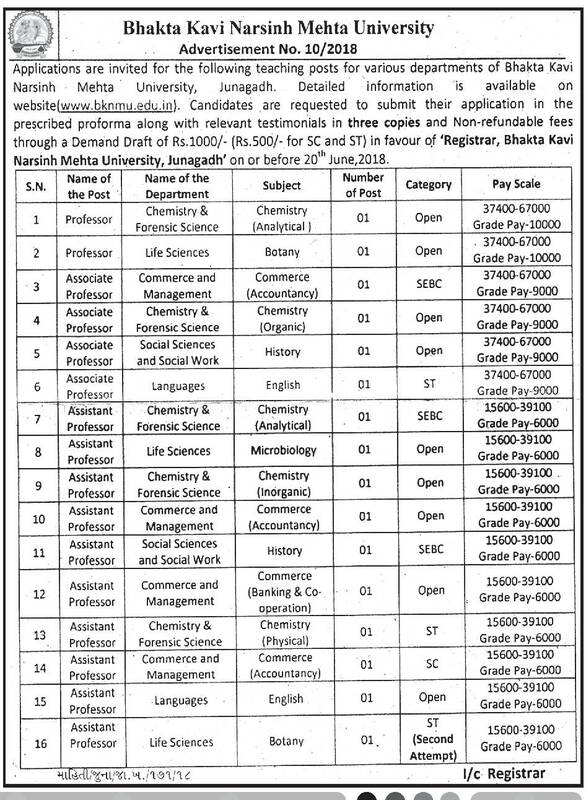 Bhakta Kavi Narsinh Mehta University (BKNMU) has published Advertisement for below mentioned Posts 2018. Other details like age limit, educational qualification, selection process, application fee and how to apply are given below. Fees: Demand Draft of Rs.1000/- (Rs.500/- for SC & ST) in favour of 'Registrar, Bhakta Kavi Narsinh Mehta University, Junagadh'. How to Apply: Interested and Eligible Candidates are requested to submit their application in the prescribed proforma along with relevant testimonials in three copies and non-refundable fees through a Demand Draft of Rs.1000/- (Rs.500/- for SC & ST) in favour of 'Registrar, Bhakta Kavi Narsinh Mehta University, Junagadh'.